Much like President Barack Obama in his recent inaugural address, Wichita Mayor Carl Brewer displayed his collectivist instincts in his “State of the City” address for 2013. His speech, as prepared, may be read here. The idea of a dedicated funding source for economic development is something that many in Wichita would support. Many would oppose it, too. But instead of just lobbing rhetorical questions (Where will those incentive dollars come from? ), the mayor should give us some answers. Or, at least make a specific proposal. Does the mayor recommend a sales tax increase? Or allocating specific levels of property tax to economic development? (The city is doing this on a temporary basis.) Or asking the state legislature to fund Wichita’s economic development, as we insist the legislature fund our airline subsidy program? Whatever it is, Mayor Brewer, give us some specific ideas as to how you want to raise this money, and how you would spend it. It’s that spending, I think, that people in Wichita have concern over. The cumulative record of Brewer, the city council, and city bureaucratic staff hasn’t inspired trust and confidence. Giving the city additional dollars to spend on economic development is not a wise investment. For example, the mayor says that subsidizing downtown development is good economic development strategy. But we see the mayor and nearly all council members voting to give an overpriced no-bid contract to their significant campaign contributors. This happened despite the company’s large cost overruns on previous no-bid contracts awarded by the city. Is that good economic development practice? We see the city council sitting in a quasi-judicial role, adjudicating the award of an airport construction contract when one of the parties is a significant campaign contributor. In fact, Key Construction — the company that prevailed in that decision — through its principals and executives, was the sole source of campaign funds raised by Lavonta Williams (district 1, northeast Wichita) in 2012 as she prepared to run for reelection this spring. Key’s executives also contributed heavily to James Clendenin (district 3, southeast and south Wichita) last year. He’s running this spring, too. At the time this airport contract was being handled, Council Member Jeff Longwell (district 5, west and northwest Wichita) was campaigning for the Sedgwick County Commission. Campaign finance reports revealed contributions from parties associated with Walbridge, a Michigan construction company. Why would those in Michigan have an interest in helping a Wichita City Council member fund his campaign for a county office? Would the fact that Walbridge is a partner with Key Construction on the new airport terminal, and that Longwell would be voting on that contract, provide a clue? Or: A movie theater owner and business partners contribute to the mayor’s (and other) campaigns. Mayor and council vote to give a no-interest and low-interest loan and tax breaks to theater owner and his partners. Mayor goes into barbeque sauce business. Mayor’s barbeque sauce is now sold at movie theater. Doesn’t Carl Brewer see anything wrong with this? Don’t his advisors tell him that this creates the appearance of impropriety? 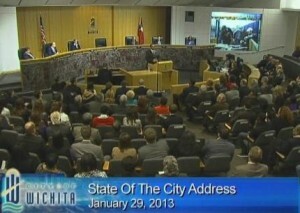 Does the mayor consider whether these actions make a positive impression on those who might want to invest in Wichita? We see the city awarding economic development incentives that were not necessary for the project to proceed. It took a special election to teach the mayor and council that lesson. By the way, that unneeded and rejected incentive was awarded to the significant campaign contributors of Mayor Brewer and most council members. We see the city taking credit for building up the tax base, yet giving away tax revenue in the form of property tax abatements, IRBs, tax increment financing, and STAR bonds. The bureaucratic missteps: The Southfork TIF district is just the latest example. The lack of respect for citizens’ right to know how taxpayer funds are spent is another troubling aspect of Brewer’s tenure as mayor. None of the words “accountability,” “transparency,” or “open government” were mentioned in the mayor’s address this year, as they have been in the past. No sense in calling attention to an area where the city has failed, I suppose. All this is done in the name of economic development and jobs. But Wichita is underperforming Kansas and the nation in these areas. Under Brewer’s leadership, however, we are overachieving in the advancement of cronyism and its ills. The record indicates that our officeholders, and those who advise them, are not worthy of our trust, and certainly not more taxes for economic development. This year, the outlook for economic freedom and limited government in Wichita is gloomier than ever before. The door for those who wish to profit through cronyism is wide open. We’ll have to hope that, somehow, Wichita can learn to thrive under this regime. Wichita, aka Chicago 2 , is a conservative city with midwestern values so why are we allowing these mentally challanged liberals run the asylum? Are they elected because no one will run against them when donars such as KEy Construction and Bill Warren fill incumbent coffers. Incumbents are taking us where we don’t want to go Hello?? ?